When Yngwie Malmsteen turned to Seymour Duncan to improve and refine his pickups the YJM Fury Signature Model for Strat, it made sense to refine another important part of his playing, his volume potentiometer. With his highly refined technique and exacting attention to sound, Yngwie employs the volume pot to take complete control of his phrasing dynamics. He uses his pinkie finger to flip the volume on and off for dramatic, lightning-fast starts and stops. That’s why Yngwie’s YJM High-Speed Volume Potentiometer contains a minimal-viscosity lubricant for fast-action potentiometer turns. At its core, the YJM High-Speed Volume Pot is a high-quality 250k, or 500k, bourns potentiometer customized for Yngwie’s playing needs. The split-shaft design of the post can accommodate a variety of knobs. This is the 250k Ohm version, and is best used with YJM Fury Stacks, or true single coil Strat pickups. Comes with mounting hardware. 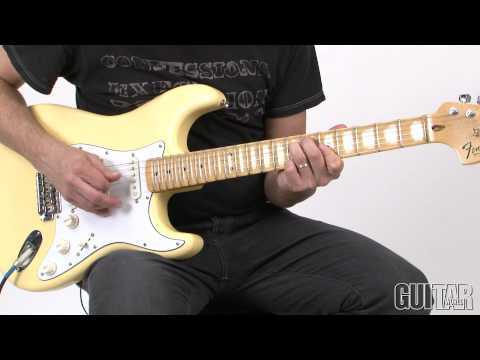 In the following video, Guitar World's Paul Riario reviews the new Yngwie Malmsteen YJM Fury signature pickups from Seymour Duncan.